Saint Lucy, was also called Saint Lucia, (283 – 304) a wealthy young Christian martyr venerated by both Catholic and Orthodox Christians. Her feast day in the West is 13 December, by the unreformed Julian calendar the longest night of the year, with a name derived from lux, lucis meaning"light". She is the patron saint of the blind. She is one of seven women, aside from the Blessed Virgin Mary, commemorated by name in the Canon of the Mass. Saint Lucy was a Christian during the Diocletian persecution. Consecrating her virginity to God and refused to marry a pagan, she also had her dowry distributed to the poor. Her would-be husband denounced her as a Christian to the governor of Syracuse, Sicily. Miraculously unable to move her or burn her, the guards took out her eyes with a fork.The record of her story comes from the fifth-century accounts of saints' lives. In the sixth century, Saint Lucys story was widespread, so that she appears in the Sacramentary of Pope Gregory I. 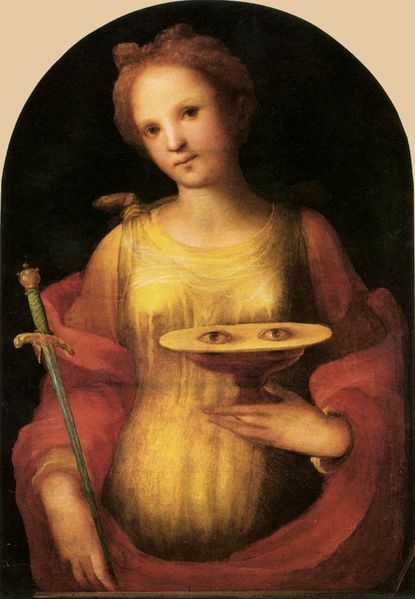 In medieval accounts, Saint Lucy's eyes are gouged out prior to her execution. In paintings, her eyes appear on a plate which she is holding. 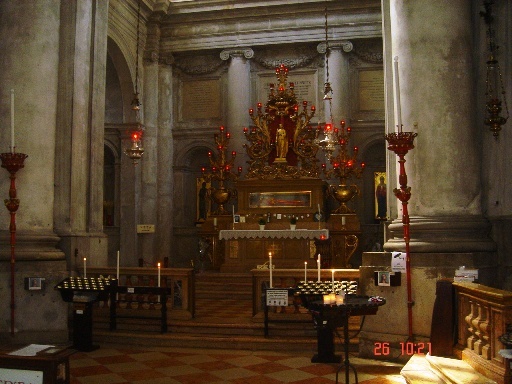 Relics of Saint Lucy were venerated in a church dedicated to her in Venice, after its demolition, they were sent to the church of San Geremia. People wanted to shed light on her bravery, legends grew up, in the acta that are associated with her name. All the details are conventional ones also associated with other female martyrs of the early 4th century. Her Roman father passed away when Saint Lucy was young, leaving Lucy and her mother without a protecting guardian. Her mother, Eutychia, had struggled four years with dysentery but Lucy had heard the renown of Saint Agatha, the patroness of Catania. When they were at a Mass, one read a gospel that mentioned of a woman who was healed of the dysentery by touching of the them of the coat of Jesus which, according to the Legenda Aurea, convinced her mother to pray together at Saint Agatha's tomb. They stayed up all night praying, until they fell asleep, exhausted. Saint Agatha appeared in a vision to her and said, "Soon you shall be the glory of Syracuse, as I am of Catania." At that instant Eutychia was cured.Eutychia had arranged a marriage for Lucy with a pagan bridegroom, but Lucy urged that the dowry be spent on alms so that she might retain her virginity. Euthychia suggested that the sums would make a good bequest, but Lucy countered "whatever you give away at death for the Lord's sake you give because you cannot take it with you. Give now to the true Savior, while you are healthy, whatever you intended to give away at your death. News that the patrimony and jewels were being distributed came to the ears of Lucy's betrothed, who heard from a chattering nurse that she had found a nobler Bridegroom. "No one's body is polluted so as to endanger the soul if it has not pleased the mind. If you were to lift my hand to your idol and so make me offer against my will, I would still be guiltless in the sight of the true God, who judges according to the will and knows all things. If now, against my will, you cause me to be polluted, a twofold purity will be gloriously imputed to me. You cannot bend my will to your purpose; whatever you do to my body, that cannot happen to me". The Christian tradition states that when the guards came to take her away they found her so filled with the Holy Spirit that she was stiff and heavy as a mountain; they could not move her even when they hitched her to a team of oxen. Even with a dagger through her throat she prophesied against her persecutor. As final torture, Saibt Lucys eyes were gouged out. She was miraculously still able to see without her eyes. In paintings she is frequently shown holding her eyes on a plate.